Archive by Author | InSequent, Inc.
Is your Site Mobile-friendly? It better be by April 21 or else! (1) The algorithm will take a few days to a week to completely and globally. 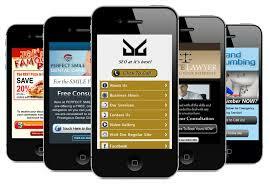 (2) You are either mobile-friendly or not, there are no degrees of mobile-friendliness in this algorithm. (3) The fastest way to see if your web pages are mobile-friendly is to see if you have the mobile-friendly label in the live mobile search results now. We are expecting it (the mobile friendly algorithm) to roll out on April 21st, we don’t have a set time period because it is going to take a couple of days to roll out. Maybe even a week or so. As we mentioned in this particular change, you either have a mobile friendly page or not. It is based on the criteria we mentioned earlier, which are small font sizes, your tap targets/links to your buttons are too close together, readable content and your viewpoint. So if you have all of those and your site is mobile friendly then you benefit from the ranking change. But as we mentioned earlier, there are over 200 different factors that determine ranking so we can’t just give you a yes or no answer with this. It depends on all the other attributes of your site, weather it is providing a great user experience or not. That is the same with desktop search, not isolated with mobile search. How do you know if your web pages will be mobile-friendly or not? There are a few ways, but Google said the easiest way is to see if your current pages have the mobile-friendly label in the live mobile search results now. Take out your phone, look up your web site. See if there is a gray mobile friendly label in your description snippet. If it is in the search results, if you see it, that means that Google understands that your site is mobile friendly and if you don’t see it then we don’t see that your site is mobile friendly or your is not mobile friendly. If your site is not “mobile-friendly” as of April 21 you will be dropping to the bottom of search results on Google. That’s not good! Mobile-friendly is no longer an option, it is a requirement. Widget – put it on your website, in ads, wherever you want. A great way to generate new leads. Digital reps armed with the 360 Audit will close more business. Use the widget on your website to demonstrate your depth and breadth and generate high quality leads. Content optimization for new pages. 1. First and most important is to write for humans and not machines. Write on the style or jargon of your potential visitors. 2. Make the text be readable for all audiences. Avoid the need for a very high level to understand the copy and stuffing the copy with unrelated keywords. 3. Carefully choose the keywords to optimize each new page. Select up to 3 keywords per page. Use keywords that match what the user is looking for. The ideal keyword has great potential search and very little competition. 4. The textual content of each page should have a minimum of 100 words. (We recommend including an intro or introduction of two extension lines to include keywords and summarize the content of the page). Maintaining a high rate in the relationship of indexable text /HTML since pages with low percentages have no SEO value. The ideal ratio is 25% to 70%, with an acceptable value from 15%. 5. Maintaining good density ratio between keywords and textual content. It is recommended that the use of keywords does not exceed 5-7% of the textual content of the page. 6. Highlight keywords on textual content using tag <strong>. 7. It is very important to the “principle of priority” in the structure of the text, ie, the further to the left is a word becomes more important for the algorithm of a search engine. This is why keywords should appear at the beginning of paragraphs and located mainly on the left side of prayer. 8. The semantic variation of the keyword is also taken into account by search engines. It is important that the content have semantic variations of a keyword (such as singular, plural and synonyms). 9. For example if we have the keyword “leather bags Milan” always better “leather bags from Milan” to “leather bags created and designed in Milan” since it acquired next higher value for the algorithm of search engines.  Page Title: Use only one keyword, the most important next to the branding. (Using more than one word, it can be considered as Google penalty-inducing technique “Keyword Stuffing”). The title will have a maximum of 70 characters.  Meta Keywords: Use the 3 keywords and 2 more related. This tag will take up to 5 words.  Meta Description: Use the first 150 characters of the text written for each page (which will correspond to the intro text, in order to ensure the emergence of the keywords in the description of the results of búsqeda). This tag will have a maximum of 150 characters.  H1, H2, and Images Atl, inbound and outbound links: Use the 3 keywords separately and together with other words to prevent the recurrence of the same content in each of these elements. The keywords you select, and appearing in the title, meta-description, URL and Hx, should also appear in the page content distributed in a relevant and consistent manner. Use a mixture of Short tail Kws (popular and competitive) and Long Tail Kws (conversion). Whenever the flow is natural and relevant keywords need not worry about the exact value of a keyword density. The content must have a meaning, never use meaningless keywords, otherwise the site could be penalized by search engines. On April 2012, many sites have been hit by the update of Google Panda Algorithm, the keyword stuffing. (Over optimization of keyword density) was among the main reasons. • Hide keywords in a small portion of the page. See an example of this at this post from Google which speaks about webspam. We’ll post some Subjective techniques in the future. If you have other tips please post them in the comments. To find out more about InSequent’s automated SEO product please email us at support@insequent.com. First it was mobile websites and SMS. Then came desktop and tablet sites. Then automated SEO, landing pages and Lead Gen. Now this weekend we will be releasing a brand new module on our Digital Services Platform – PPC/Paid Search. We have a super simple way to place ads across Google, Bing, Facebook, Twitter, Linked-in and many more to start driving new customers to your business. We will send out more details upon the release. It is your connection with your customers when they are on the go. Businesses have been capturing email addresses for quite some time but the mobile number is even better (you know the younger generations don’t really “do email”). Use a QR Code or you can have them send a simple text with your own keyword to a shared shortcode like ours (55411). Many of our business customers are racking up hundreds and even thousands of their customers mobile numbers. What do you do then? Our platform has a simple Group Send feature for you to create one message to all your subs with special offers so you can fill those tables, clear that inventory, invite them to a speaker series or all of the above and more. Bonus: it will also auto-post to FB, Twitter, G+, your blog and more. Text messages are instantly received and usually instantly read. Make the offers good and you will see the response. To maximize opt-ins offer them something to sign up – a free appetizer or a small discount will do the trick. Put the invitation to join the “VIP Club” or whatever you want to call it on your website, your social networks and most important at the point of sale in store – check out, table tops, bathrooms, the bar – wherever your customers go. Remember you are not forcing anyone to do anything and if your offers are good, and your invitation tasteful, you will soon have a large list of your regular customers just a text away.